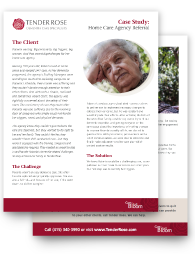 Both suffering from dementia, the Nelsons desperately needed care but had no close family to help. Their health, house and finances were in disarray. Mrs. Nelson was paying the bills (the same bills, over and over again). Mr. Nelson’s aphasia caused financial errors as well. He refused medication for his liver transplant and sunk deep into depression, sleeping all day. 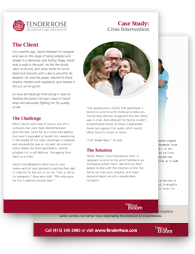 Nina’s first home care agency couldn’t keep up. Fiercely independent, Nina lives alone in a sprawling house her husband built, a place with sentimental value that she refuses to leave. As her dementia worsened, Nina began rejecting the agency’s help with daily activities and throwing their caregivers out of the house. But after undergoing shoulder surgery, rehabilitation was crucial. Bill is a force of nature. A successful businessman and philanthropist, he’s warm, smart, curious, and kind. Bill loves life and lives it to the fullest. When he was diagnosed with dementia, he was determined to find the support he needed to continue living life on his terms. Accustomed to the best, he called Tender Rose. 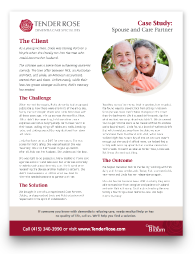 When we met the couple, Rick’s dementia had progressed substantially. Now there were only hints of the articulate, funny man with boyish charm who Linda fell in love with all those years ago. In his place was the new Rick. Now, if Rick didn’t like something, he’d use a few choice expletives and strike out physically. He’d wreak havoc in their house, pulling things off tables and walls, breaking locks, and striding around the neighborhood from dawn until dusk. Harold, always a stickler for certain social rules, was becoming more and more rigid in his expectations. Something as simple as running a little late could trigger his agitation with his kids. The relationship was falling apart fast. When we met Miss G, she lived alone in an upscale high rise, surrounded by her expensive art collection. She’d been professionally successful throughout the 80s and 90s, running a company and proving herself in what was then primarily a man’s world. Now an elderly woman with advanced dementia, Miss G drank heavily, refused to stop driving and had a nervous habit of picking at her legs, creating wounds that were constantly at risk for infection. Dorothy was 95 and a resident at an assisted living facility, but the staff and other residents were struggling with behaviors related to her progressive dementia. 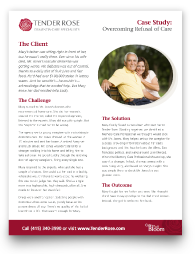 By working together with Dorothy’s daughter and her assisted living facility, we were able to provide the one-on-one care Dorothy needed to avoid moving to the memory care unit prematurely. 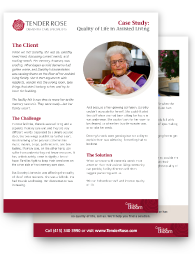 The facility could turn their attention to other residents, and Dorothy’s daughter knew her mother would enjoy the highest quality of life she could give her. David was in crisis and on the verge of having to move to a locked facility due to a violent outburst following his wife’s death. Read on to learn how David went from being in crisis to doing the things he loved -while remaining in his own home- with the help of a supportive team of dementia experts. 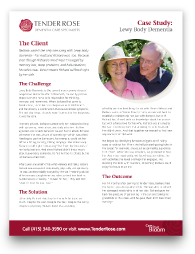 Barbara struggled with intense symptoms related to her Lewy Body dementia, including frightening hallucinations, frequent agitation and violent behavior. She regularly attacked her husband in fits of panic, and he was at a loss as to how he could help her. 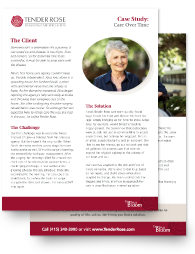 We stepped in and were able to act as a buffer between Barbara and her husband, coaching him on the healthiest and safest ways to respond to her extreme outbursts and reengaging her in meaningful activities. 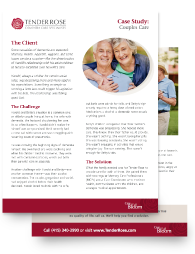 Our client, Earl, had a very complicated set of challenges related to his frontotemporal dementia, including dramatically inappropriate behaviors and an extreme lack of empathy. A community of dementia care experts came together to develop creative solutions to get him the care he needed so that he could remain safely in his own home. Ever since his wife died, Mr. Jones’s vascular dementia was getting worse. His diabetes was out of control and he’d had over $100,000 stolen in lottery scams. 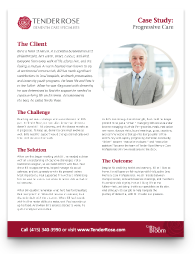 Discover how we stepped in to stabilize Mr. Jones’s situation, and give him the support he needed to live a life of joy and meaning again. 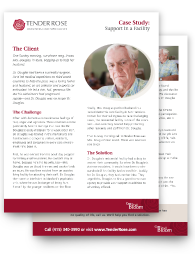 After numerous violent outbursts stemming from his Alzheimer's disease, Dr. Douglas was on the verge of being evicted from the last facility who tried to care for him. 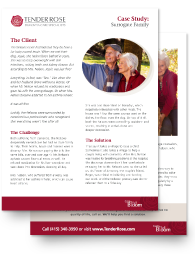 We brought in a team of highly trained Memory Care Professionals to serve as a buffer between him and the other residents, ensuring their safety and improving his quality of life. 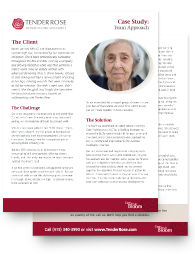 Nearing 100 years old, Roberta lived at home alone and needed 24/7 care. As her dementia progressed, the agency's Staffing Managers were spending so much time replacing caregivers on Roberta's schedule, their morale was suffering and they couldn’t devote enough attention to their other clients.